Below is a picture of several of our more popular Video Screen sizes. The white screens are "Front Projection" where the Projector sits out in front of the screen in the audience side. The gray screens are "Rear Projection"" where the projector sits behind the screen, and projects through it to the audience on the other side. Both types of screens have advantages over the other and we can help you select which type will be best suited for your event. Front screens can be placed against the wall. 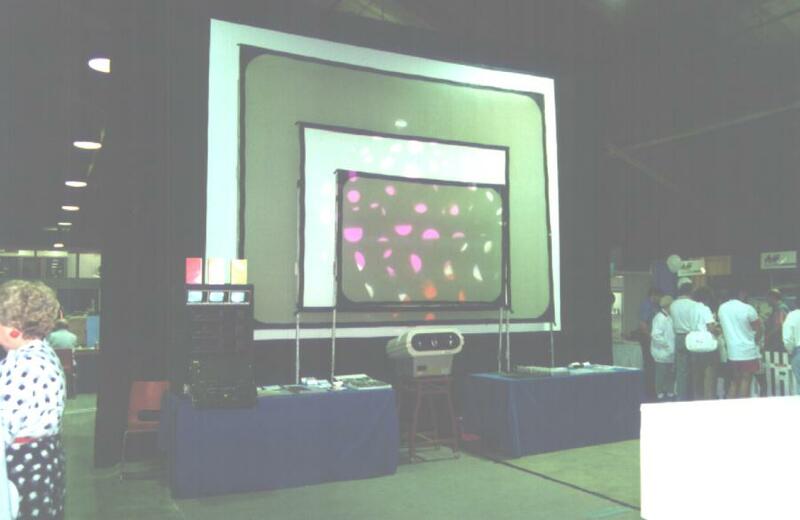 Rear screens provide a good image even with room lights on, and the projector is not visible to the audience. We provide the right size screen to suit your needs and budget. We have the experience to calculate the correct projector for your room lighting conditions to ensure a success at your event. email us your requirements for a prompt reply with your quotation. Please remember to provide details like location, date, time, size of room, what you are projecting, and any other important details. Thank You. Page designed and hosted by m-m-t.com.